Phantom Cardboard: Is That Goal Regulation Size, Or What!? Is That Goal Regulation Size, Or What!? For the longest time I didn't make any cards featuring Adam Sandler despite all of his classic sports related movie roles. I just didn't think there was a good chance at getting any of my cards signed. That all changed because now I know a guy who knows a guy who can get me some Sandler sigs. Once that relationship was forged I went to work and churned out 7 Sandler joints as they say in hip-hop circles. The one above is by far my favorite of the lot. Sandler has some fun movies, but I have to think Happy Gilmore is the best. 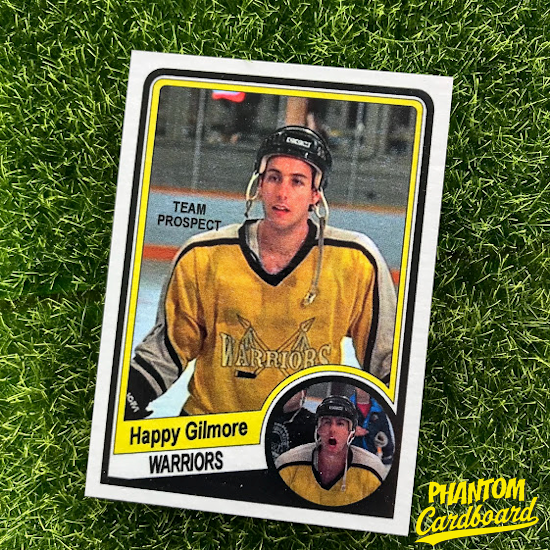 It starts out right away on a hilarious note with Happy trying out -unsuccessfully for at least the tenth time- for the semi-pro (I'd presume) Waterbury Warriors. That whole scene is classic, and now has a card devoted to it. Happy Gilmore was released in 1996 but, like I have with almost anything released after roughly 1990, I plugged it into a more vintage inspired design. For this one I used a 1984 Topps hockey inspired design. For the record, I f***ing love this design and have used it any time it has made sense to me to create a number of really fun cards. It screams 1980's card design to me. I love the rounded two-tone frame and the secondary picture. I used the Warriors' team colors for the two-tone frame of course. My favorite part might just be the "team prospect" text. Every so often you'd see text like that reading something like "traded to the ..... ". I always assumed it was a last minute thing when a guy would be traded but it was too late to re-do his card. Since Happy never officially made the Warriors' roster, well, he's a team prospect. Now, I'll just wait with bated breath for some Sandler autographs. If you'd like to own a copy of this card it's available in the PCb online store.